Over the next several decades, experts predict that millions of tons of trash will be headed for the world’s oceans, with plastic constituting the vast majority of all that garbage. The exact impact of so much plastic in the ocean has yet to be fully determined, but scientists are employing new research methods to study just that. A group of University of Georgia scientists studying the issue agree that the amount of trash floating around the oceans could instigate an enormous effect on the environment on par with climate change itself. During the recent search for the lost Malaysian airplane, satellites repeatedly found debris in the ocean thought to be pieces of the plane, only to discover the debris to be mere garbage floating at sea. This unfortunate and highly publicized event brought some attention to the growing problem of plastics littering the ocean. Over 130 species of marine life have been found tangled in sizable ocean debris, but perhaps more frightening is the fact that the majority of ocean debris is composed of micro-plastic, or plastic decayed to microscopic size and often ingested by marine life. The discovery of micro-plastic lead to the realization a decade ago that cleaning the world’s oceans would be an even larger problem than originally believed. A number of entities, including dozens of plastic manufacturers from all over the world, are attacking the problem of ocean garbage. Some of those companies market products made from recycled ocean plastic. Beach cleanups have also become popular in recent years. But the magnitude of the problem is so daunting that these programs tend to have little to no overall effect. Ocean debris moves in “patches” created by the current, with the largest one (The “Great Pacific Garbage Patch”) measured at twice the size of Texas. 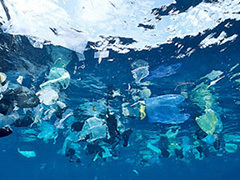 The National Oceanic and Atmospheric Association (NOAA) estimates that 68 ships working for ten hours per day over the course of a full year would only be able to clean about one percent of the North Pacific, and the amount of new garbage created each year continues to grow. The rate at which manufacturers produce plastic has multiplied in recent years, and unless communities across the globe begin to implement massive cleanups in and around coastal areas, the problem only stands to be magnified throughout the coming century. Posted on June 16th under Pollution Reduction.